London, UK--One week after London daily newspaper The Telegraph outed the whereabouts of Nirav Modi (left), the billionaire diamantaire has been arrested, ending a yearlong posh life in exile from his native India. When Telegraph reporters caught up with Modi two weeks ago, he was sporting an $11,000 ostrich-hide jacket, and reportedly living in a luxury 3-bedroom flat costing around $17,000 per month. He also had reportedly begun a new diamond and jewelry business. A report in JCK said Modi was labeled a flight risk and subesquently denied bail, and that a warrant also has been issued for Modi's wife, Ami. Separately, the mess created by Modi and associates is spreading farther in the United States. JCK reports that both Indian authorities and a U.S. examiner have linked associates of Modi to Bailey, Banks, & Biddle, the prestigious 187-year-old retailer founded in Philadelphia in 1832. The company, which for a long time was a part of Zale Corp. before being sold to now-defunct Finlay, is now based in Austin, TX, and has three remaining stores after closing two--in Houston, TX, and King of Prussia, PA--in recent weeks. Meanwhile, Samuels Jewelers, owned by Modi's uncle Mehul Choksi, closed last month and is being investigated for fraudulently selling synthetic diamonds as natural. Developed to help all US retailers, the hour-long program—split into three informative modules—offers educational material and quizzes, going beyond the Four Cs to highlight the intangible value of natural diamonds, billion-year-old treasures of the earth. The initial beta launch has yielded positive feedback from jewelers. “Getting back to basics, often we get so caught up in the technical aspects of our career that we forget the emotional aspect. Thank you for bringing the reality of relationship-selling back to the forefront,” said Cheryl Worcester of Maine-based Days Jewelers. In addition to the training program being free of charge, there are rewards for retail sales people who complete the program. Points are awarded for each module completed, and can be redeemed for up to a $25 gift card to one of several popular retailers. Retail sales associates who complete the program will also be entered to win a grand prize of an all-expenses-paid trip for two to New York City. Valued at $4,000, the trip will offer exclusive behind-the-scenes access to the New York diamond industry, including a personal tour of a diamond cutting facility. The drawing will take place in the fall. Visit www.diamondproducers.com/tradeportal to access the e-learning platform and informational video. The average store growth in 2018 for silver jewelry sales was 16%. Retailers said their silver jewelry sales, as a percentage of their overall jewelry sales, were on average 24% of their unit volume and 18% of their dollar volume. 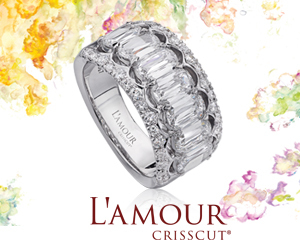 51% said silver experienced the best inventory turnover rate in 2018; 12% said diamond; 14% said bridal and 12% gold. 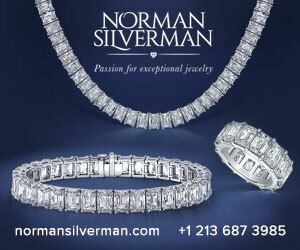 84% of retailers say they are optimistic that silver jewelry sales will continue to grow. 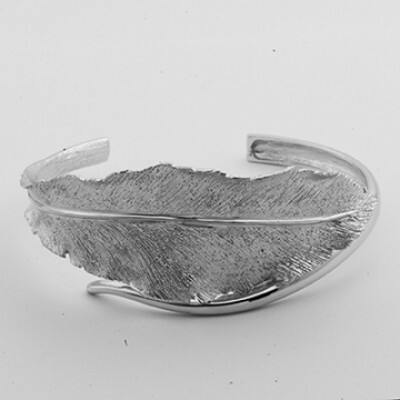 Sterling silver leaf cuff from the Constellation collection by Charles Garnier. The survey, conducted by INSTORE magazine,was fielded in February 2019. It represents the tenth consecutive year that SPS has commissioned such a survey. The Silver Promotion Service was introduced in 2008 by the Washington DC based Silver Institute. The objective of the SPS is to develop and implement programs designed to enhance the image of and stimulate demand for silver jewelry in major international markets. For more information, visit www.savorsilver.com. For more information on the Silver Institute or silver in general, please visit: www.silverinstitute.org. Biel/Bienne, Switzerland—Swatch Group’s announcement last summer that it would exit the Baselworld Fair was a sour blow to the already beleaguered exhibition, which has seen a sharp decline in attendance and exhibitors in recent years. At the time, Swatch executives left the door open to a possible return at some future date, but last week CEO Nick Hayek said that’s not happening. In an interview with Bloomberg, Hayek said there was “no need for it anymore,” and a Swatch Group spokesperson confirmed the pullout in an article in National Jeweler. 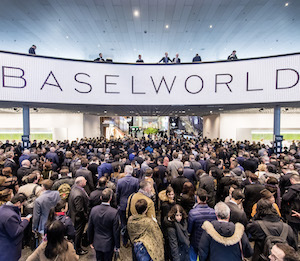 The 2019 edition of the Baselworld fair opens Thursday, but beginning next year Baselworld and SIHH in Geneva have agreed to run back-to-back dates to better accommodate buyers. Swatch Group CEO Nick Hayek calls the Baselworld Fair "needless." Swatch Group, which in addition to its own watch brands also supplies movements to other high-end watchmakers, won’t be doing that much longer, either. The company spokesperson told National Jeweler that both LVMH and Richemont will have to look elsewhere for parts for their luxury watch brands once their current contracts with Swatch Group expire at the end of this year. Swatch Group posted strong results in its annual report, with a 15% increase overall, and an 11% increase in its luxury and prestige sector; a welcome reversal of sharp declines it experienced just three years ago. Swatch brands include Breguet, Harry Winston, Blancpain, Omega, Longines, Tissot and Swatch. Angola—The Angolan diamond mining company Catoca Ltd. Mining Co.—a collaboration between Russia-based ALROSA and Angolan national company Endiama E. P. —has introduced new corporate governance initiatives. "We are pleased to state that our cooperation with Endiama, the second major founding shareholder of Catoca, is reaching a new level of development. Since last year, ALROSA and Endiama have been discussing opportunities to improve corporate governance at Catoca Ltd. After detailed consideration and elaboration, shareholders unanimously adopted all the proposed innovations at the recent general meeting. This indicates a uniting desire to develop the company and contribute to the strengthening of the Angola economy," said Sergey Ivanov, ALROSA CEO. Founding shareholders of Catoca decided to establish Supervisory and Fiscal councils to control, approve and finalize contracts and approve executive directors. The company also will rotate between the two main shareholders when appointing a CEO and deputy for financial affairs and the board will maintain parity representation of the two shareholders. "This will definitely improve the quality of work on current and future projects, including the Luaxe project, making it more transparent and efficient,” said Ivanov.